The temperature sensors I am using are the Inveo Nano PoE sensors. They are quite industrial and cost around £100. In hindsight I realise I could now make a wifi connected temperature sensor for around £2.50 or add a temperature sensor module to my new light switches for a pence, but possibly not as good. Update: It looks like I could connect a DS18B20 (the sensor the Nano uses) to any of my new Sonoff light switches with incredible ease. So yes, for the cost of the sensor (under £3) I could have put temperature sensor attached to the new light switches and saved £100. Arrrg! They work quite well. Slight hassle setting up as on a fixed IP not DHCP, but documented well enough, and they will do DHCP. They have several ways of working including SNMP. I set one up in the bedroom, and this is what I have been testing with for a while now. A cron every minute got the temperature by SNMP and fed in to my air-con control stuff using MQTT. However, the other two that I had ordered finally arrived yesterday, and they don't work. Arrrg! The SNMP simply does not respond. Yes, I check the manual and the config (it is one tick box to enable SNMP), but nothing. Only difference is new ones are version 1.18 and old one is version 1.17. I was pulling my hair out. 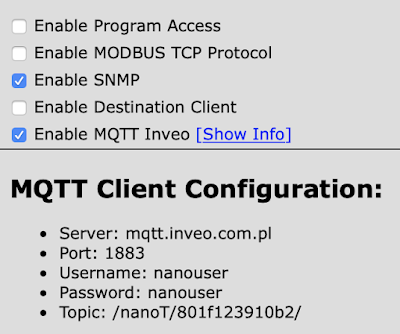 Then I spotted another option: MQTT. 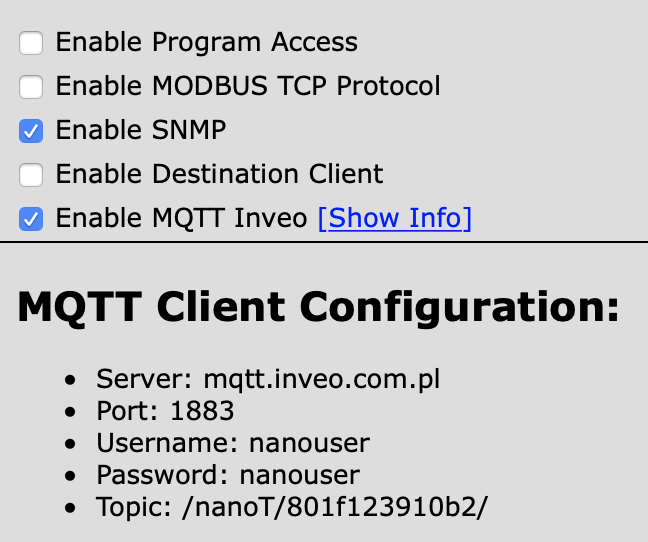 When I first installed one I had not looked at MQTT at all, but now I am using it, and in fact feeding the SNMP result in by MQTT. So I tried that. 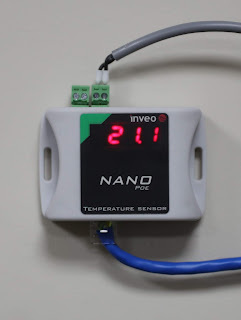 It is quite nice - it sends temperature every minute, and if it changes (e.g. 0.1 degree change). This had a rather unexpected side effect of making my air-con control too good. It reacted instantly, turning off the compressor when temperature hit the target so the code. It was also trying to keep the average temperature at target and could never win as it never went over target! As a result my room was within 0.2℃ total variation all night which is amazing! I also noticed that the air-con seems to not try the compressor again for 5 minutes, which probably makes sense, and ensures I am not wearing anything out. As a result, every 5 minutes, it runs the compressor for 20 to 30 seconds or so - whatever needed to reach target temp, and stops. It does work rather well. You might be interested in this. It's a print monitor which connects to the Octoprint 3D printer monitor running on a raspberry pi. The five minute hold-off is to limit the numbers of starts/hr the compressor can do - starting a motor is much much harder thermally than just running it. If you're going to run the system so that it runs right at that limit all the time, you might want to keep an eye on the temperature of the compressor (and its associated starter), particularly once the weather is hotter. Obviously that limit *should* be set so that you can run against it indefinitely, but we all know how these things go in real-life. Five minutes may well have been plucked out of the air, with real-world use of their own control algorithm not providing a continuous stress-test like you're doing. Indeed, one to watch for. "This is a bit odd, as it seems to mean I could poke temperatures in to their MQTT cloud service for any sensors if I know the MAC." Knowing the MAC is easy - you just need to subscribe to /nanoT/+ and you'll get every topic. You *ahem* might even be able to subscribe to # and $SYS/# and get even more detail, such as the mqtt server version, and every client as it publishes information. There are even messages for nanoO devices, which appear to be a relay. You may want to watch out for running it for short periods and give it a wider temp drop or rise that is acceptable. As Will Dean said above, this will put much more stress on the system and it could cost you more in electric used due to the higher input to get things moving. On the cheap alternative side, RPi Zero W is about a tenner and allowed a multitude of sensors, assuming you don't have a suitable board that can just take one. I don't understand why products like this can't have a much tighter hold on the temperature out of the box. Why does my AC think that by 20 degrees C I mean "anything between about 18 and 22 is fine do whatever you like"
At a guess - Because running the compressor for a long time then turning it off is the most power efficient behaviour, and we all buy AC units based on their power efficiency rating. Personally I don't much care if it's +- a couple c if that's more efficient. In the summer all I care about is being <24c in the office, and <22c in the bedroom. The DS temp sensor is accurate to +/- .5C best case according to the maxim datasheet. As I say, not really an issue of consistent, what was a pain is wildly varying temperature. If if have to set 21.5C for comfort and in reality it is 21.0C - I don’t care. Can you tell me how you can make a wifi temperature sensor for £2.50? One of each of these plus a USB cable for the power.